Actress Lee Yeon Hee (이연희) attended the launching party of UAM (United Asia Management) on June 24, 2011 at Banyan Tree Club and Spa located in Jang Chung-Dong, Seoul. 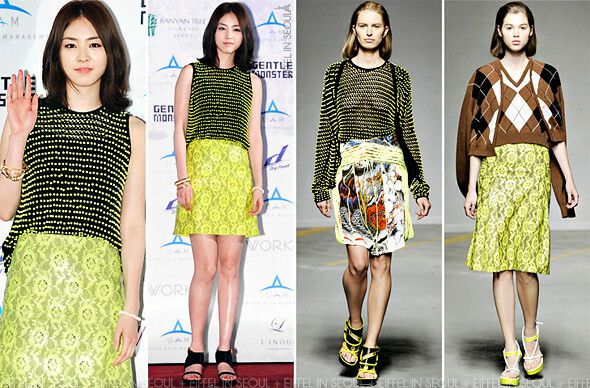 The actresss walked the red carpet in a neon yellow outfit from Christopher Kane Spring/Summer 2011 collection. Her outfit was styled with bracelets and bangles with a pair of black sandals. This is how you get attention on the red carpet. Lee Yeon Hee (이연희) definitely stood out among the other stars wearing such a bright outfit. Her outfit would be perfect with a more interesting pair of shoe and a big smile. The Laser-Cut Leather A-Line Skirt she wore is currently on sale for USD$ 1775.00 1065.00 (40% off) on Net-A-Porter. Check out Christopher Kane sale on Net-A-Porter. Sigh...why does she always look so blah to me?